Species: Carp, Tench, F1's, Crusians and Roach. the Roach average 6oz but there are hundreds over 1lb. Any pellets and groundbait can be used for feeding. Any pellet can be used on the hook. Always use landing net to land fish. Top Methods: Pole, Feeder and Waggler all work. but don't set it to tight. 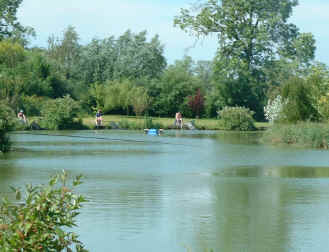 Trotters is an excellent lake as it contains a variety of species and being quite wide (approximately 20mtrs. to the island) there's enough room to fish a variety of methods - all of which work. 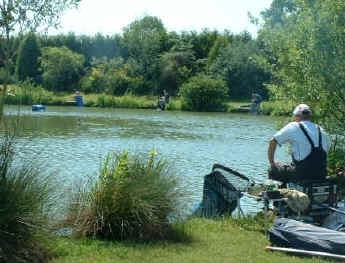 Whatever peg you sit on, you are able to cast too the island with a feeder/ straight lead and if conditions are right even a waggler. Apart from Carp there's a good head of other species to target if it's one of those days when the Carp refuse to feed. The quality of winter Roach fishing attracts top anglers from all over the midlands.